Students are learning the importance of road rules at an early age. 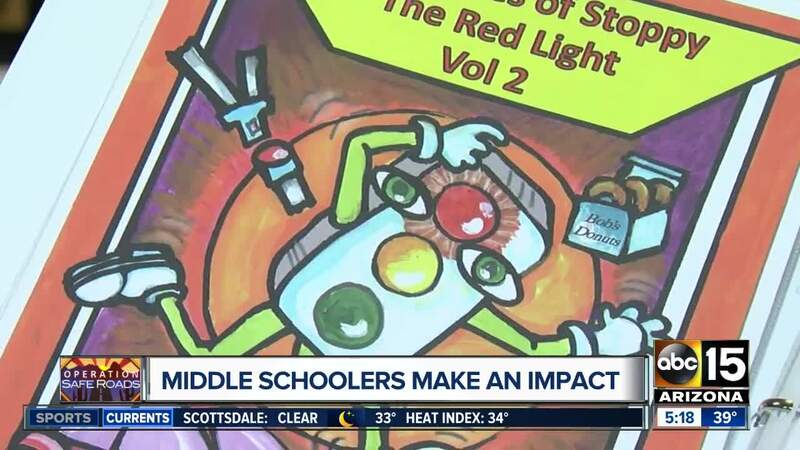 GILBERT, AZ — Everyone knows red means stop and the 6th graders at Patterson Elementary in Gilbert are no exception. But one tri-colored stop light with gloves and a hat made them start thinking about solutions to major problems along Valley streets, intersections and sidewalks. "Tell them what I made you do last week -- Carolina?" "What's the liability that just happened with that parent?" Bonnie Hickman challenged her pre-teens to tackle traffic issues, and not just by talking about them, but by calling lawmakers -- the class met with several at the Arizona State Capitol last week -- and by developing ways to reach people of all ages. With the help of a local artist, Mrs. Hickman's classes have published a comic book with "Stoppy" as the superhero. It's old-school storytelling with a high-tech twist. Readers will find QR codes that connect them to apps, games and video clips on their phones. The comic covers everything from seatbelt safety in the backseat to limiting distractions up front and reminding your parents that distractions in the car just aren't OK. They've got the story board ready to go for the next edition addressing scooter and bus safety. "I think...their ability to realize that just because they're 11, doesn't mean they can't make a difference in the world," Mrs. Hickman told me. "There's big issues that if they don't get it figured out as to who's supposed to be where, we're going to have a lot more car accidents and a lot more moms having to say goodbye to a kid." You can lean more about the big issues they're putting into print next to change our state's laws and to change our driving habits at RedMeansStop.org.